Food, wine and culture from a Portuguese Canadian. Scrub the mussels under cold running water, pulling off the “beards” with your hands. Fill a large pot with water and add mussels. Cover and place on a burner with the heat turned off. In a large skillet, sauté onion in olive oil, adding a 1/4 cup of cubed pieces of Toucinho(Portuguese style bacon) stirring over medium heat for about 4 minutes. Stir in the garlic, sauté for 30 seconds, then add the crushed red pepper paste. Turn off heat set to the side. Turn the burner under the mussels on to high. Cook the puréed tomatoes for 4 minutes, adding the cream. Then add the wine and salt and pepper to taste. Stir in parsley and keep the sauce over very low heat. Meanwhile, steam the mussels for about 6 to 9 minutes until they have opened. Then transfer the mussels to the skillet that has the sauce. 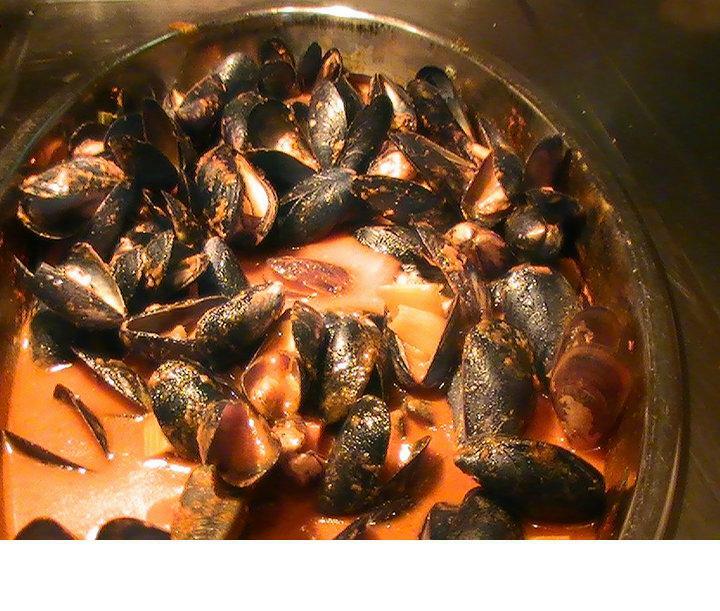 Stir some sauce over mussels. Cover with lid and cook for 2 more minutes so the flavours fuse together. Discard any that do not open. Arrange the mussels on serving plates. Spread the shells slightly, or break off the empty half; and spoon some of the sauce over each mussel. Great with a crusty bread and your favorite white or light red wine. Enjoy !